I think Brett Adair is on that tornado warned cell. Josh Johnson. He and their entire crew are very good. BMX going with a severe thunderstorm warning for Elmore County, so I don’t guess they will extend the tornado warning eastward. You were correct, Bama Ravens. It went north of us. The Pine Level community is so small that a one mile wide tornado would cover over half of the community. Confirmed tornado with debris noted on radar north of Elmore moving towards Eclectic. Thanks, Austin Dawg. It missed us by a mile or so. Tornado on the ground with the Elmore County storm. 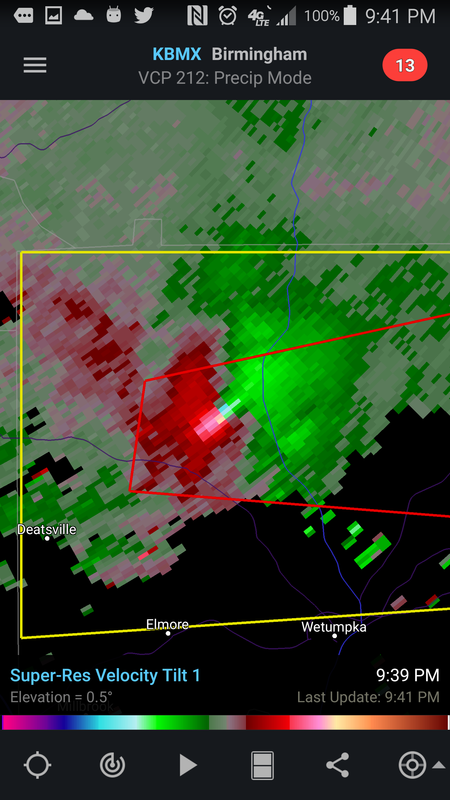 Very bad looking couplet and CC drop. I don't like to hear those situations at all. Looks like Brandon Clement has driven up on tree damage. Significant Damage reported on Hwy 231. Very likely this area has been hit with a significant tornado for the 3rd time this year. Fwiw, northern storm tornado warned again in Randolph. Moving into Georgia. Multiple photos and videos coming out of the Clanton area tornado, impressive being after dark. Looks like a rather big one; interested in seeing what sort of damage there is tomorrow. Those last two big supercells had some insane, long-lived signatures, probably easily capable of significant tornadoes. Any concerns about the storm coming up on Talladega, AL right now? Storms definitely intensifying in that last batch east of the Tuscaloosa-Albertville line... lots of lightning in some of them. Still some rather decent shear in east AL and marginal CAPE, but stuff is getting really capped off according to mesoanalysis. Been showing some broad rotation coming up through Talladega County the last half hour.